Christmas is a time to be merry and bright! This wall sculpture is sure to make your friends and family stop and stare; not everyone has an animal-friendly large faux taxidermy deer in their home. 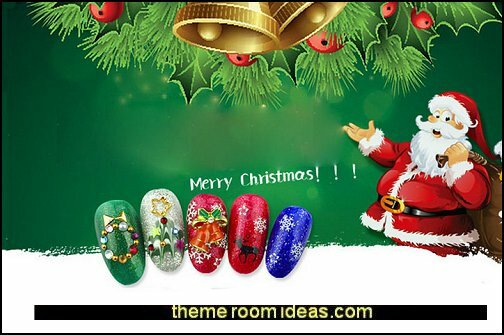 If you’re dreaming of a white Christmas and only see brown through the windows, use wallpaper art to bring your wishes true. 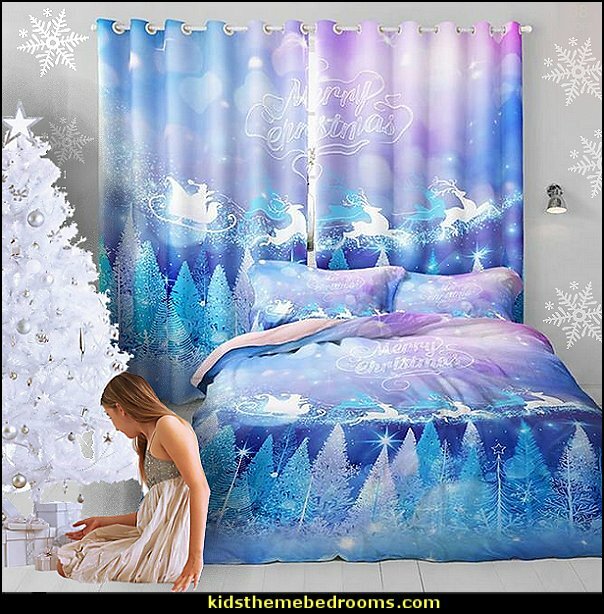 Wallpaper art can bring smiling snowmen into your kitchen, a wintery wonderland into your bedroom and ice skaters circling on a frozen pond into your living room. 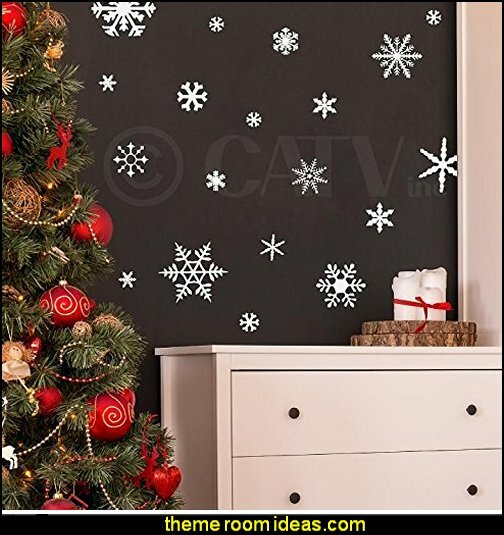 With wallpaper murals providing an ambiance of winter inside, you don’t have to crank up the heat or find your mittens and hat to stay warm. 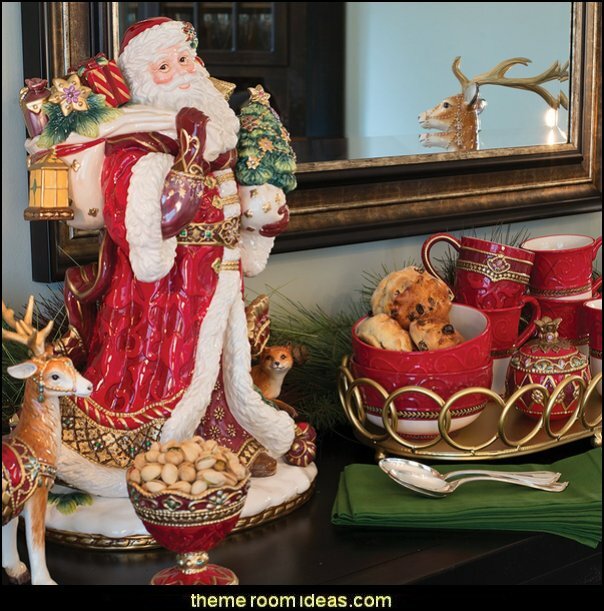 Embracing the essence of extravagance so prevalent during the Christmas season, Renaissance Holiday Santa Figurine and Standing Deer Candleholder elevates your holiday home with ease and sumptuous style. Both pieces embrace a maximalist aesthetic which is inspired by historical fabric fashions and interiors. Rich and opulent, the luxurious mood unites plush devorè surfaces with heavy embellishment and intricate hand painting. eye-catching, classically arched headboard is fully upholstered, super-soft and ready to enchant your bedroom. With her dramatic silhouette and nailhead trim, Ella will grace your decor, be it traditional or eclectic, for countless nights to come. 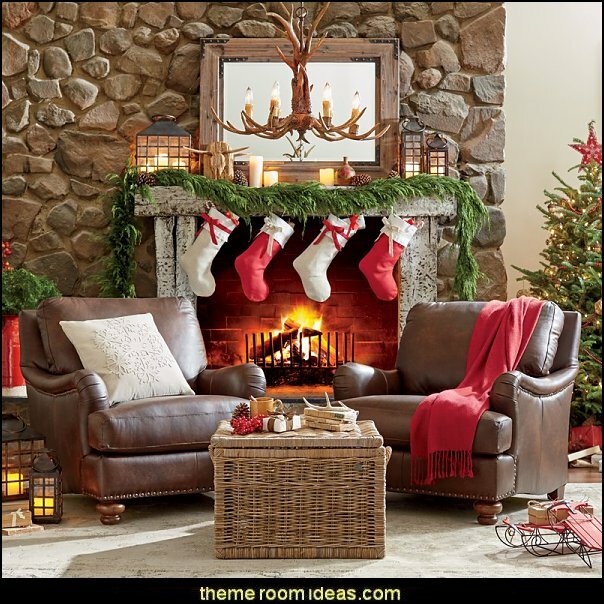 Consider setting up the Christmas tree next to the fireplace strung with stockings, and behind everything hang a mural featuring a wooded treescape with white snow sparkling in the sunshine. Leave the mural up during the entire winter season, or just put it up for the Christmas holiday. 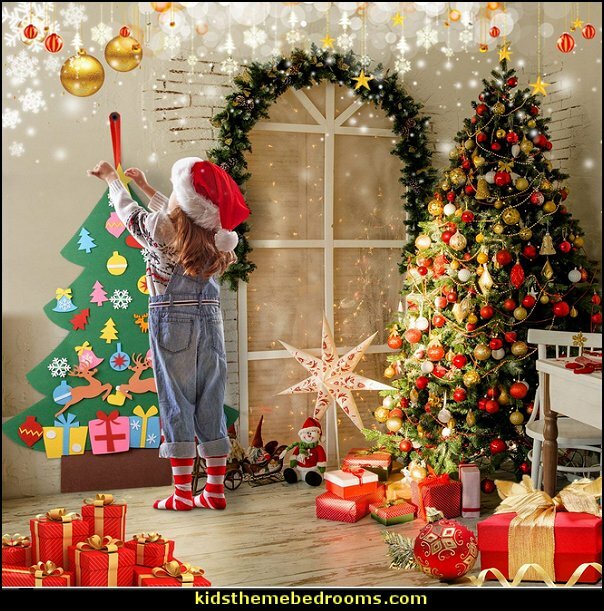 Murals make for perfect seasonal decorations because they can be rehung many times without damaging the mural or the walls. 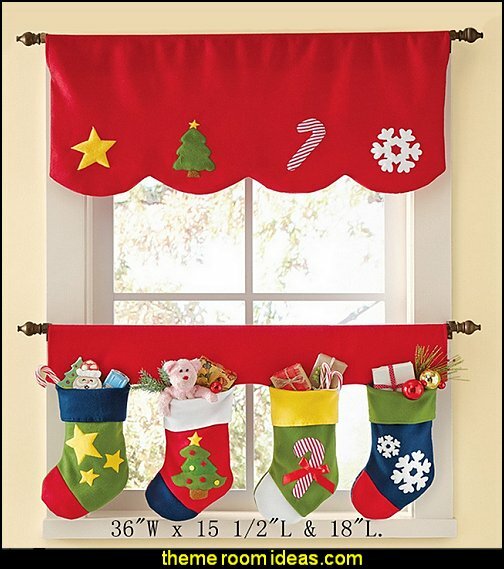 Just roll them up to store during the rest of the year and bring them out when you’re ready for a white Christmas. 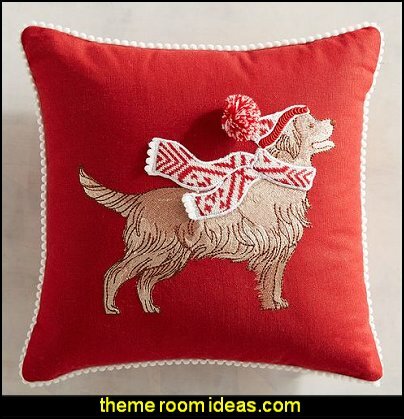 Decorated with festive appliques and corner poms, our throw pillow will add a bright spot of color to your chair, sofa or bed. 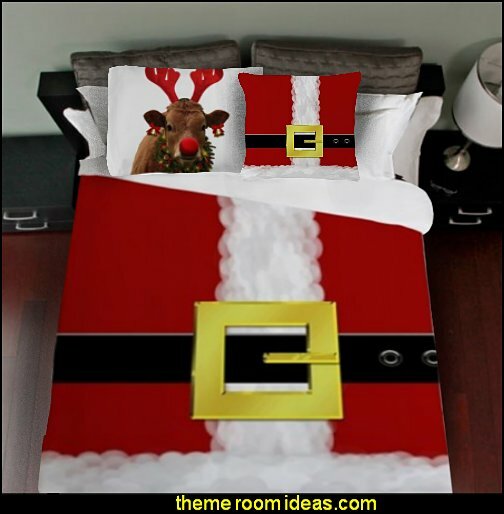 We all know St. Nick is jolly, but you can add “comfy” to his personal traits, too. 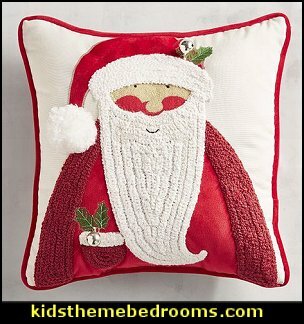 Artfully embroidered and boasting a fuzzy appliqued beard, our festive pillow features UV-resistant fabric for indoor/outdoor merriment. Why drive around your neighborhood to look at Christmas lights? 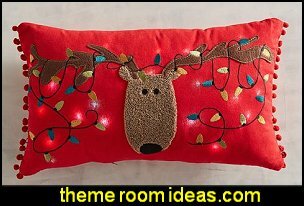 With our light-up pillow, you’ll enjoy holiday illumination from the comfort of your own sofa or armchair. 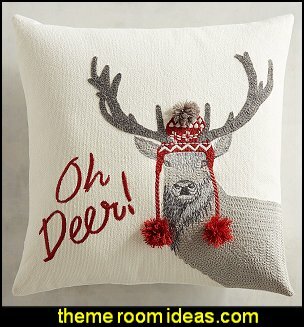 Although this buck may be embarrassed by his hat, we’re sure you’re going to find an appropriate place to display our handcrafted pillow that’s part wordplay, part silly and totally fun. 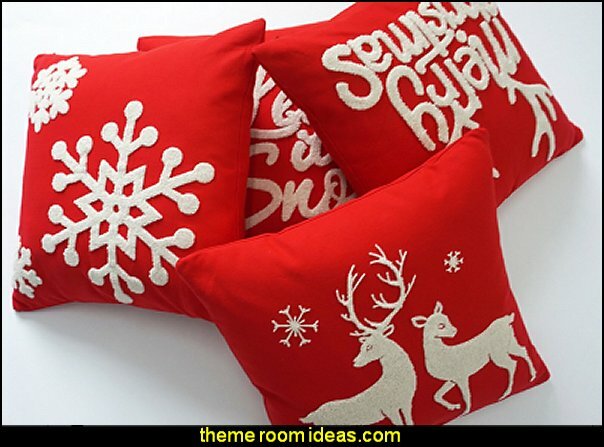 With lots of texture, stripes and a happy holiday message, our stylish Christmas pillow sets the tone for the season on your sofa, bed or armchair. They look great indoors or out! 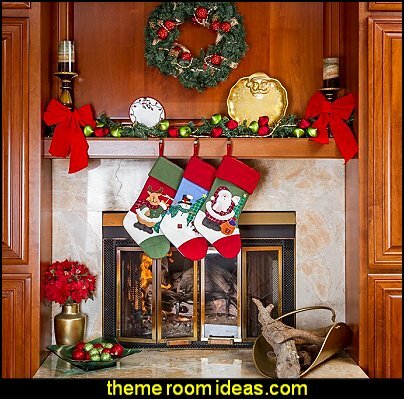 Use them to create a festive welcome in your foyer, above a fireplace, or in any bare area of your home. 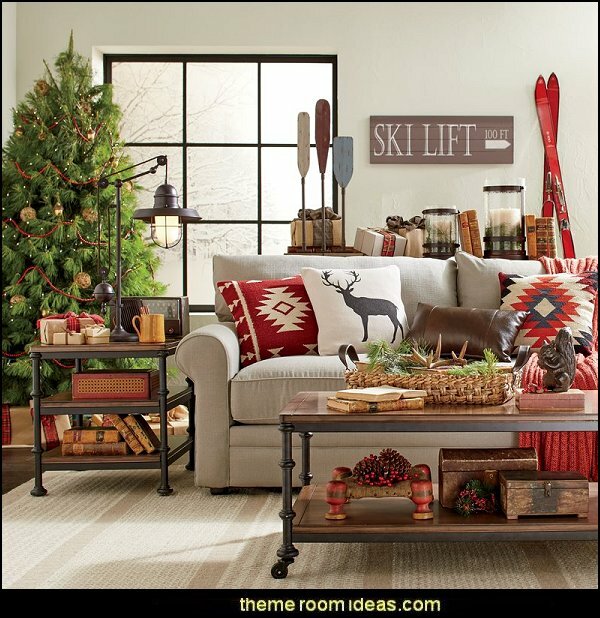 Bring nature's winter beauty indoors for an impressive holiday display. 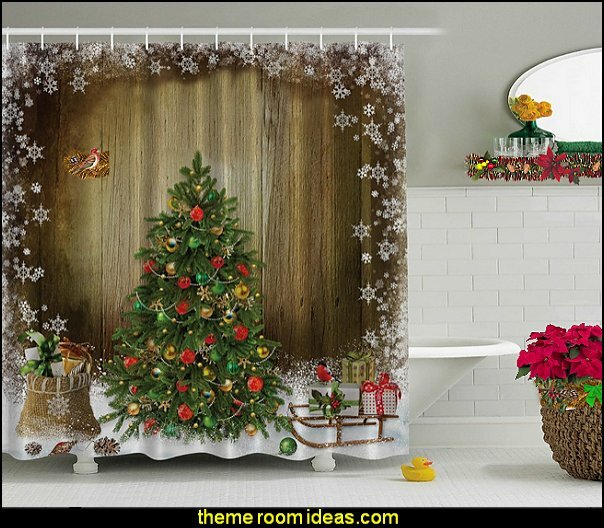 Lush pine boughs tipped in "snow" and decorated with red berries and pine cones. 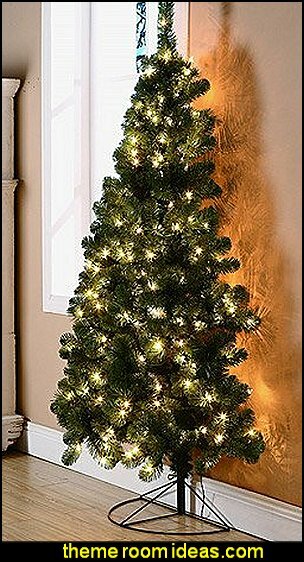 16" decorative light up wall tree set makes your holiday nights merry and bright! 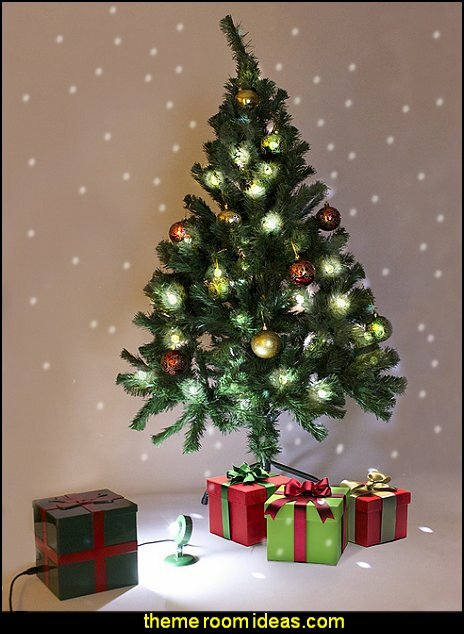 These lifelike pine trees come decorated with 20 shimmering LED lights, red velvet ribbons. Can be hung individually on a door or window or grouped together to create a stunning display . Warm up your holiday décor with a beautiful mantel scarf. 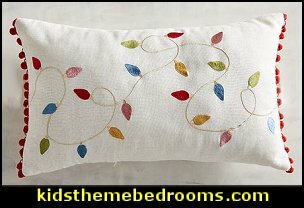 Give yourself a view onto snowy pines with this brilliant gold foil pillow embroidered with crisp white boucle snow. 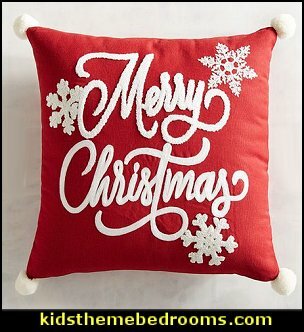 Merry and bright, this adorable rectangular throw pillow will add flair and style to your decor all holiday season long. This pillow is perfect to coordinate with light furniture, gold furnishings to give your rooms a polished look. 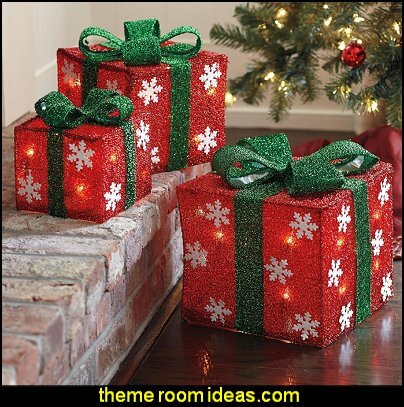 A cheerful addition to holiday decor, this gift box set is covered in soft, glittery tinsel fabric and features 35 lights. Bows are velcroed on top & boxes can be nested inside each other for easy storage! 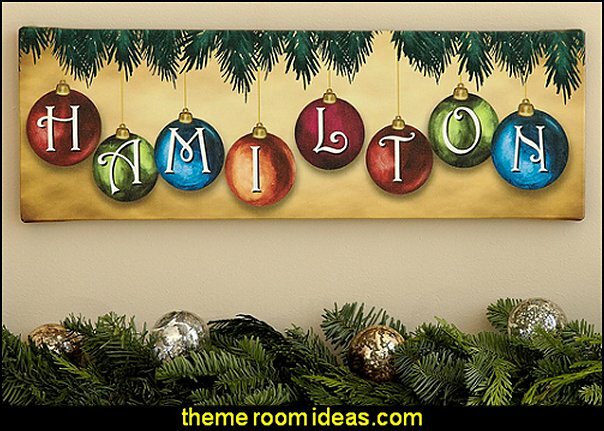 Accent your holiday home with our distinctive "Family Name Ornament Canvas". A lovely finishing touch for your mantel. It features retro-style ball ornaments in dazzling jewel tones. 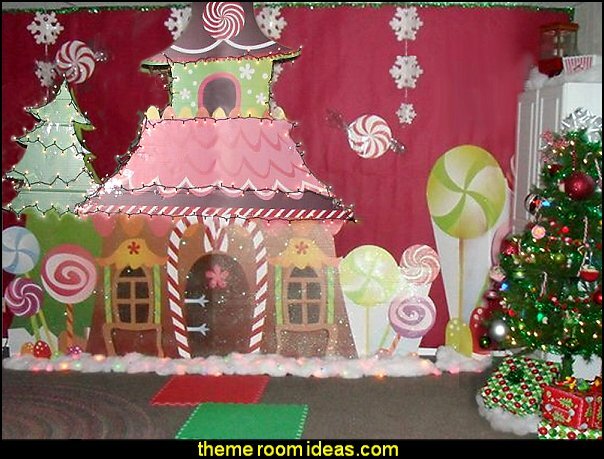 The StandUP Tree Skirt is a whole new twist on the traditional tree skirt. 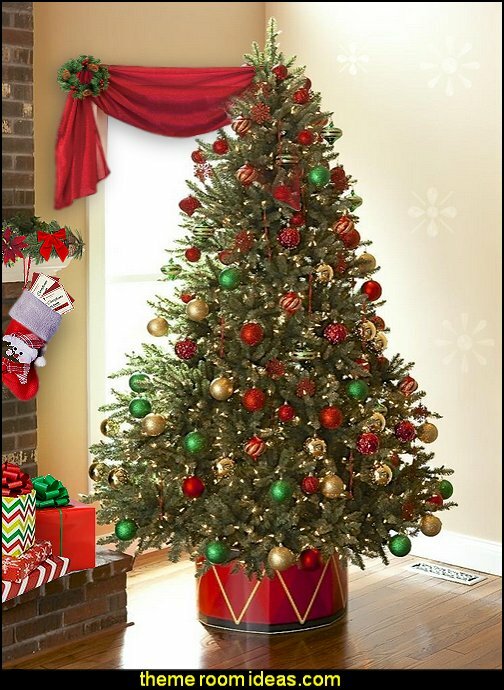 Unlike ordinary tree skirts, the StandUP Tree Skirt completely hides the trunk of your Christmas tree while covering the tree stand. 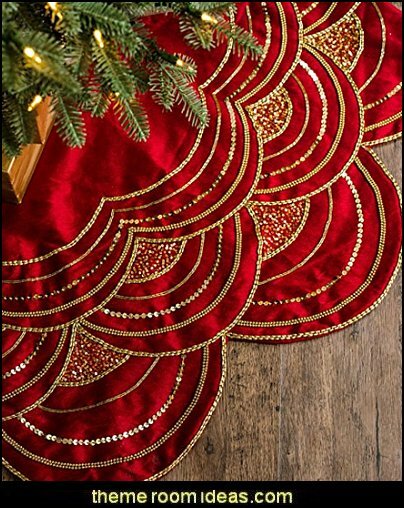 The new StandUP Tree Skirt brings a fresh and festive look to your holiday decor! Made of a unique and heavy duty paper material called cover stock. It is thick, durable and sturdy enough to stand up by itself. The special printing process gives the StandUP Tree Skirt a rich glossy appearance and protection with a clear UV coating to minimize fading over time. 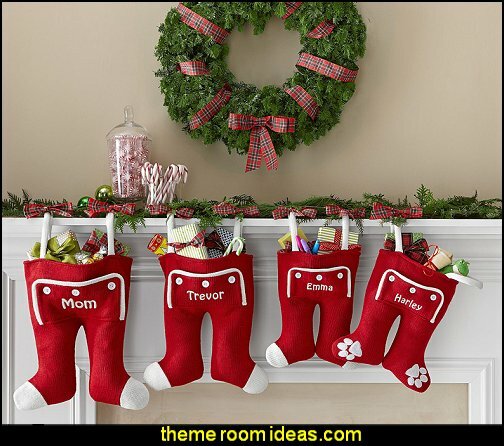 Personalized Santa Long John Christmas Stocking looks just like the ones Santa would wear - right down to the 3-button flap on the rear! 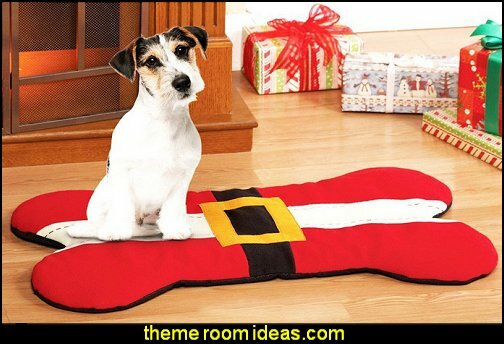 Select from small/pet (16"Lx9½”W), medium (18"Lx11”W), or large (21"Lx12½”W) stocking. Santa's personal chauffeur is ready to go solo. 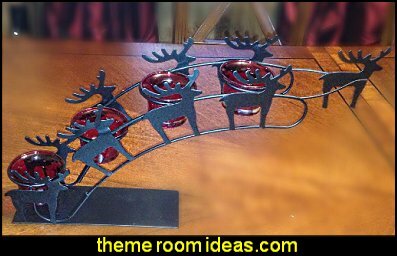 This charming holiday candle display features seven red glass candle cups set in a metal framework that's led by a reindeer cutout. 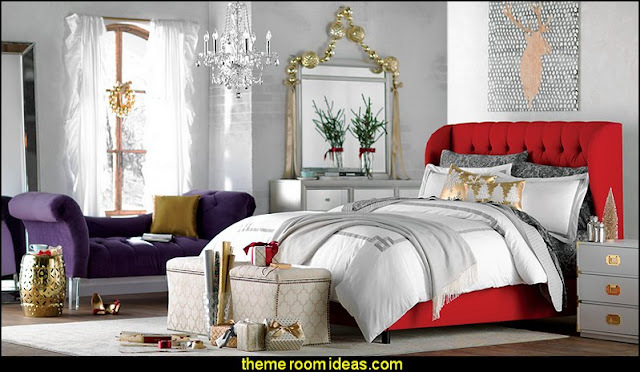 Easily redecorate any room without spending a fortune. 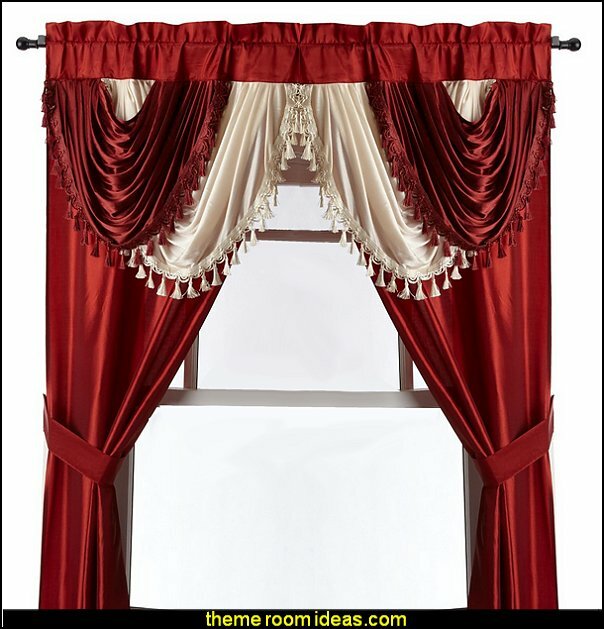 A complete window set which features two window panels with an attached valance to give you an elegant finished look, all hung on one standard curtain rod. Tie backs included. 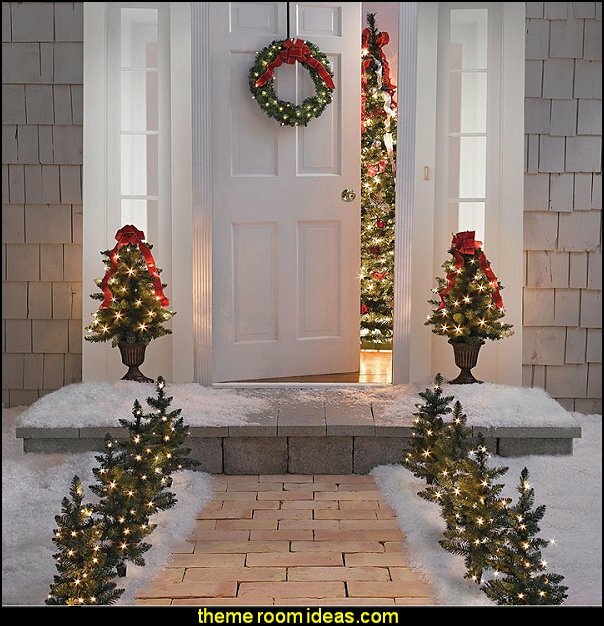 Garland shines beautifully with 50 warm wite LED lights and 8 magical light settings. 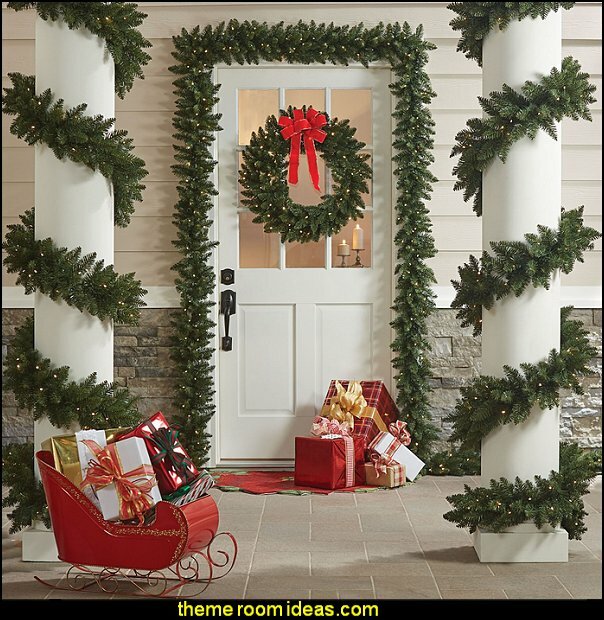 This top-quality artificial garland is nearly indistinguishable from the real thing. Real-needle technology gives our garland a gorgeous appearance with lush needles and full boughs. 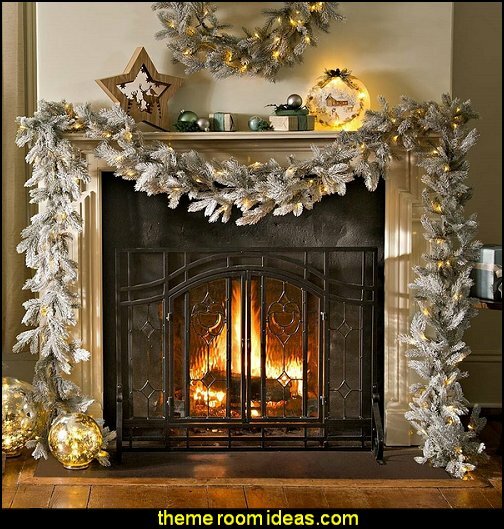 This incredibly realistic garland will steal the show with its light choices you can change from soft glow to twinkle, steady on and more. 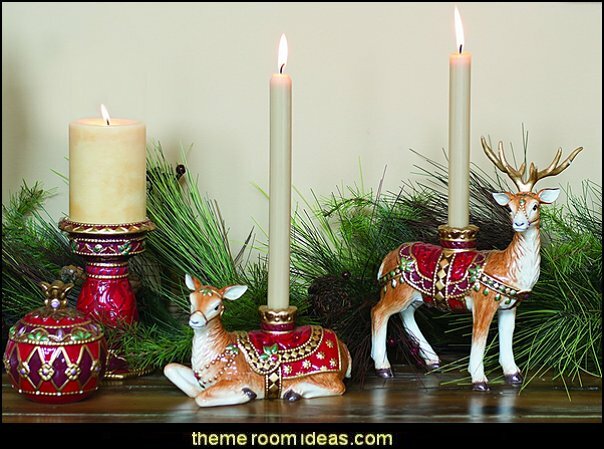 Shine a light - beyond just Rudolph's nose - for Santa and the silent night to arrive with the Flying Reindeer Candle Holder. 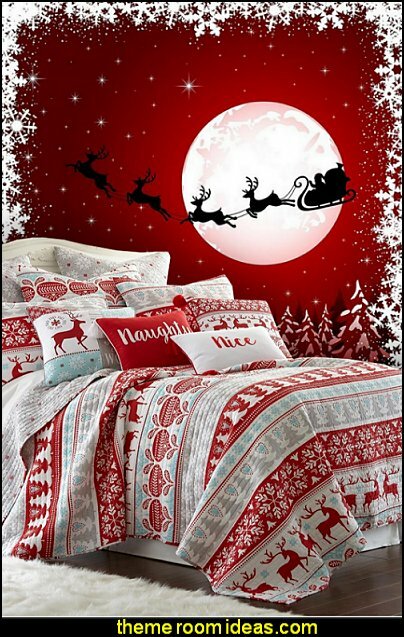 The metal-cut design reflects five of Santa's reindeer, ascending into air. 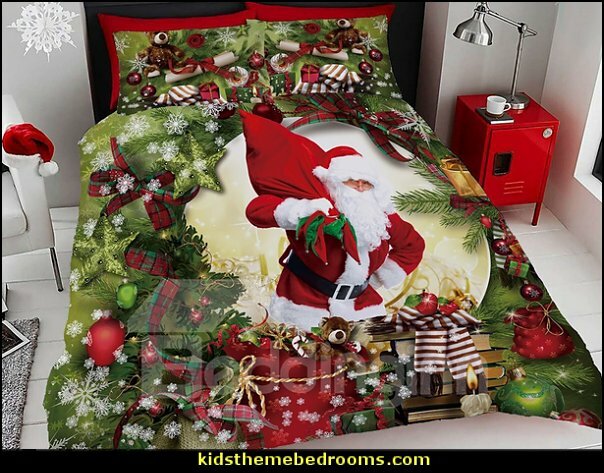 A lovely holiday piece that will compliment any Christmas decor and will have kids gawking at in wonder. Elegant faux crystal angels sparkle with a heavenly glow! 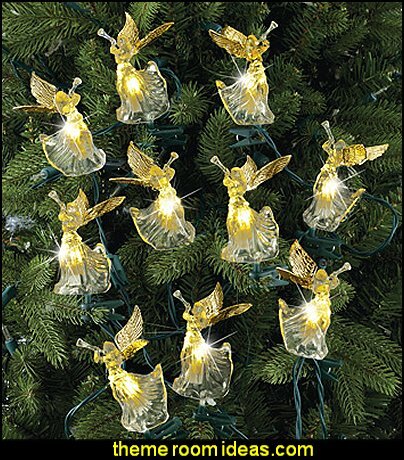 Impressive angel light string features 10 beautifully detailed angels with gold wings and white lights inside. Clips on each angel allow you to easily position on a tree or clip to a garland. The frosted glossy finish on these candles presents a warm reflection of ambient light and are perfect for your favorite table, shelf, mantle and are ideal for various special events such as wedding centerpieces. 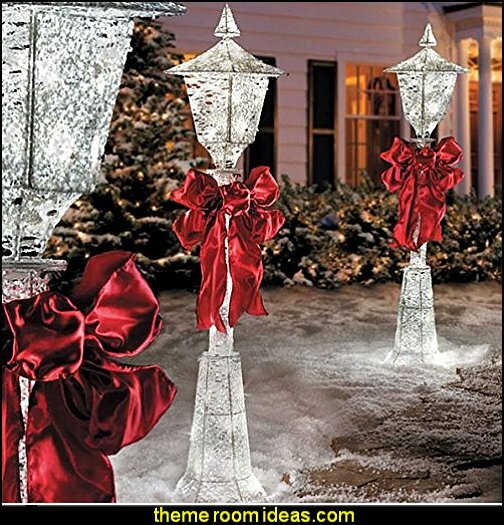 These frosted glass candles are perfect for Christmas holiday decor and always make an ingenious gift. 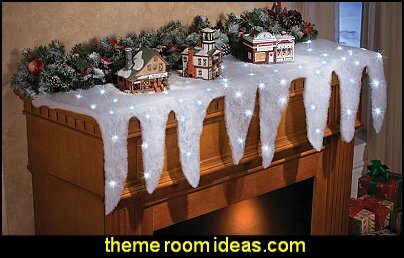 This light system creates a cascade of snow on your Christmas Tree, mantle, or anywhere that needs a little extra cheer! 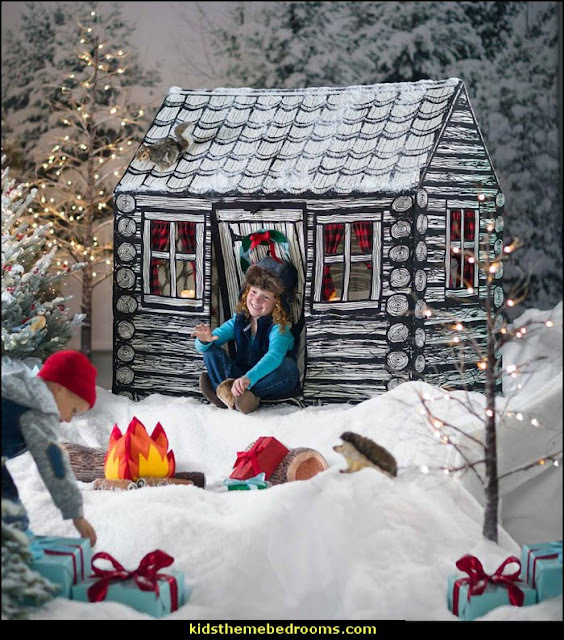 This magical box, shaped and decorated like a gift, blends in with all your presents! 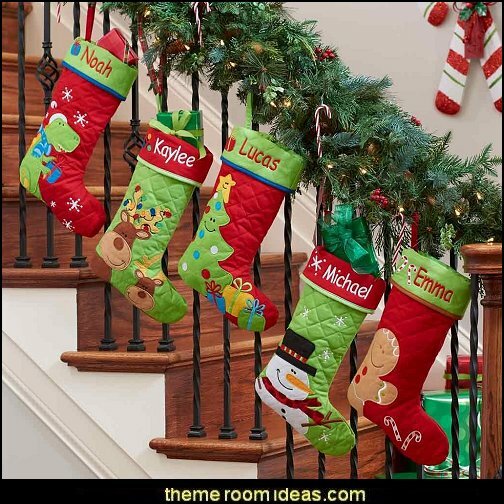 Bring joy to your holiday season with adorable Quilted Christmas Stockings featuring smiling and festive Reindeer's with colorful antlers. 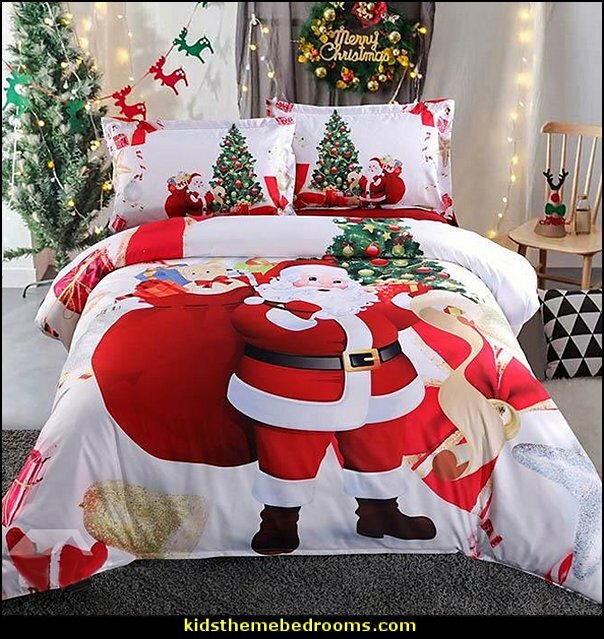 When it's cold outside and you just want to bundle up, you know that Christmas is coming and it's time to get the gifts ready. Santa/Tree Pillow (Assorted Styles) - Wondershop - Toss some holiday cheer on the sofa or chairs in the living room, family room or TV room with the Wondershop Santa/Tree Pillow (Assorted Styles). 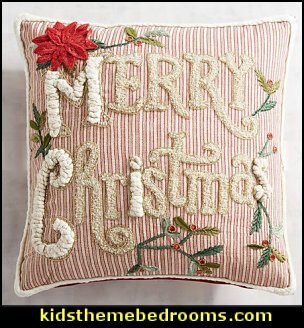 These pillows, with their bright red, pink, orange, gold and green colors, will put a smile on the faces of family and friends. 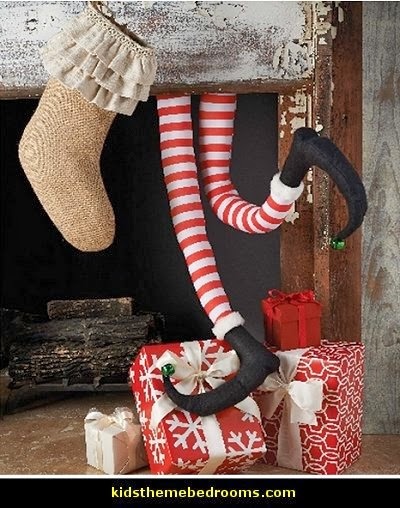 The perfect holiday touch. 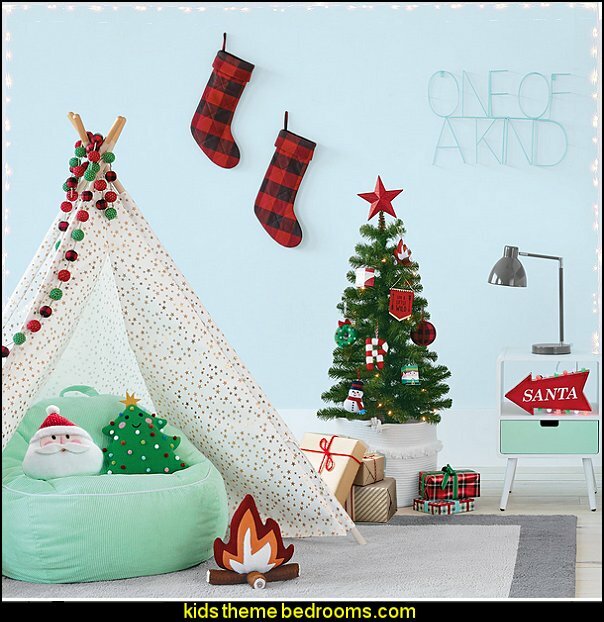 Lit Santa Arrow - This fun flashing arrow will guide Santa where he needs to go. The bright red color, glittered accents and flashing red, green and white LED lights are sure to grab everyone's attention. It is battery operated and comes with a convenient red metallic hang string. 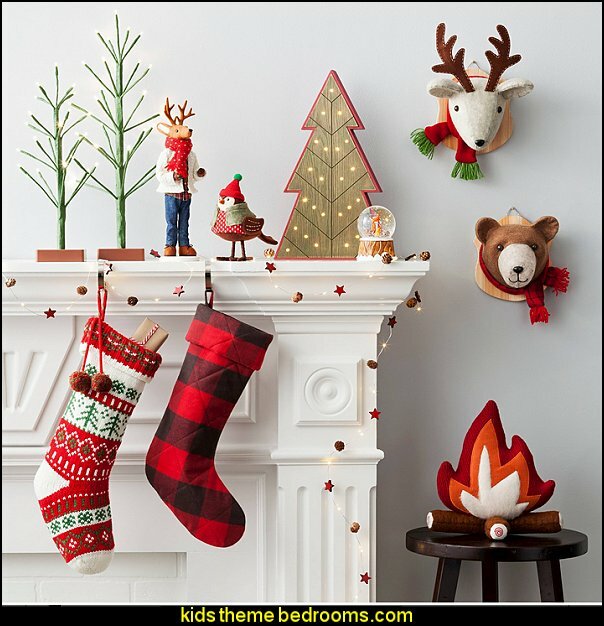 Red Quilted Buffalo Check Christmas Stocking - Hang the Wondershop Red Quilted Buffalo Check Christmas Stocking on your mantel or banister and bring out the holiday spirit. The big buffalo checks and quilted stitching give this stocking a festive appeal, and it's roomy enough for all sorts of fun holiday treats! 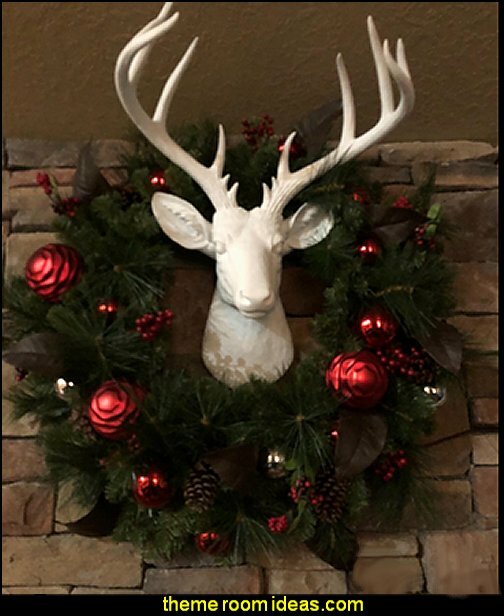 Reindeer Wall Mount - humorous holiday version of the hunter’s trophy. 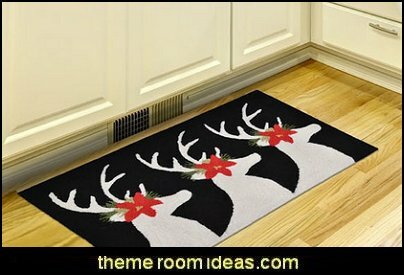 This wall art has a stuffed reindeer head with a colorful scarf mounted on a wooden plaque. Bear in Scarf Decorative Wall Décor - Go for a little whimsy this winter with the Wondershop Bear in Scarf Decorative Wall Décor. This fun bear will happily hang on your wall all season long. Display him by your mantel or in your entryway for some extra holiday cheer. 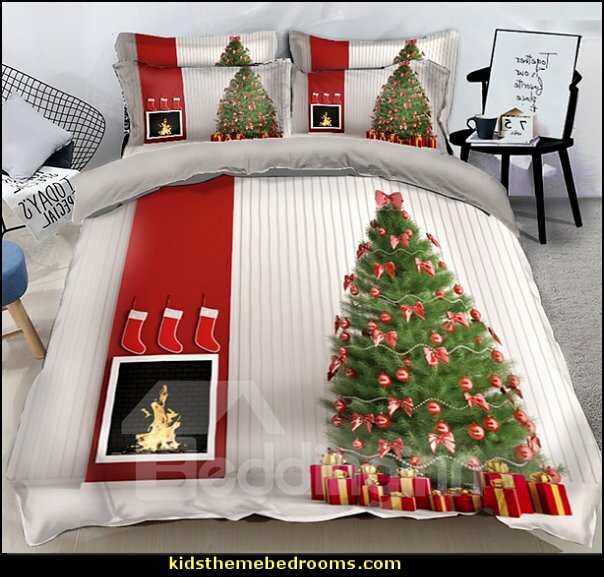 Camp Christmas Fire Décor Pillow - unique way to warm up during the holidays. Feast your eyes on this accent pillow with a 3D look of a campfire. 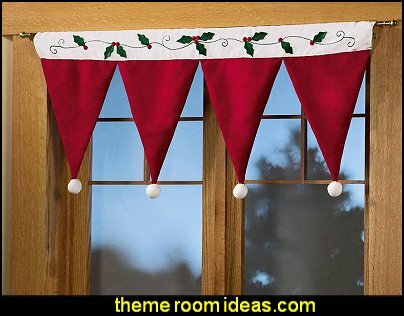 Santa Hat Valance: This adorable valance looks like a row of upside-down Santa hats a great alternative to lights or garland. Made of faux suede, it s trimmed with pom poms, appliques and embroidery. Rod pocket for hanging. Polyester. Wipe clean with damp cloth. Brighten up your mirror or doorway with corner bouquets. 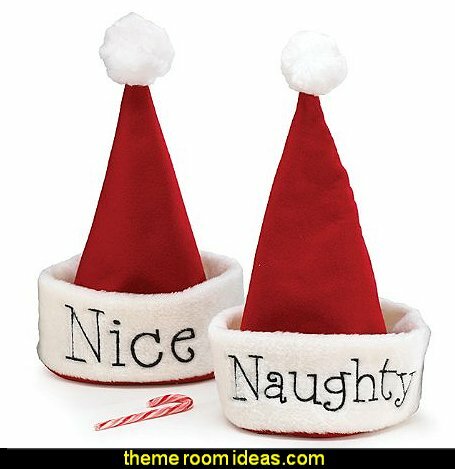 Use them around windows, pictures and doorways, or even place them on a table. 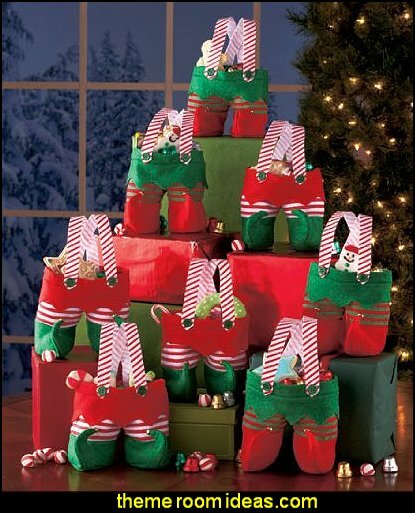 These Elf pants treat bags are an adorable way to give sweets, gift cards and small gifts during the holiday season. 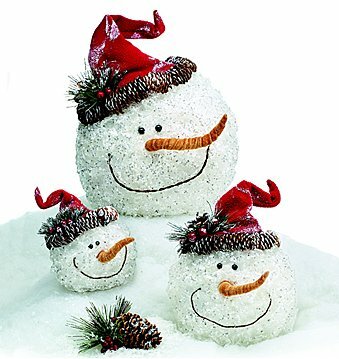 Fun and festive containers are perfect for Secret Santa, teacher, co-worker and hostess gifts. 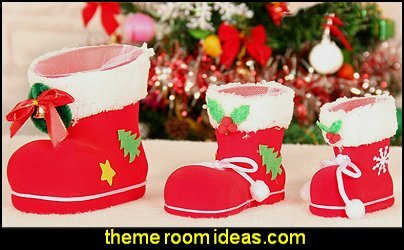 Cute details, such as suspenders with buttons and boots with jingle bells, make these bags memorable. 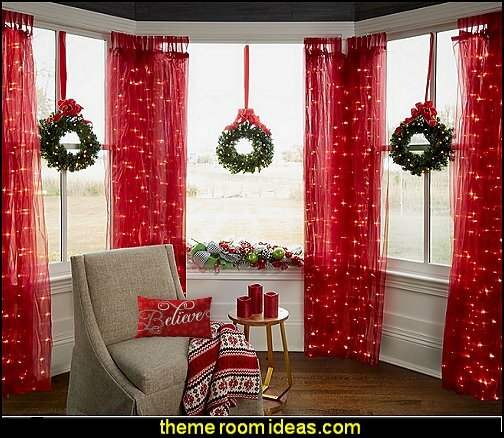 Accent with Christmas ornaments in unusual ways that don’t involve a Christmas tree. 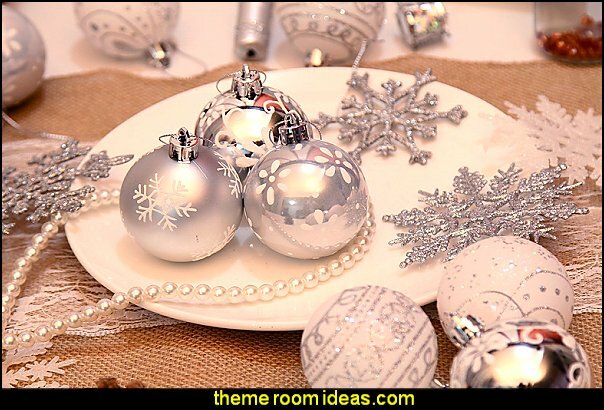 Consider decorating the holiday table with ornaments in a glass vase as the centerpiece. Or dangle them from the chandelier overhead. 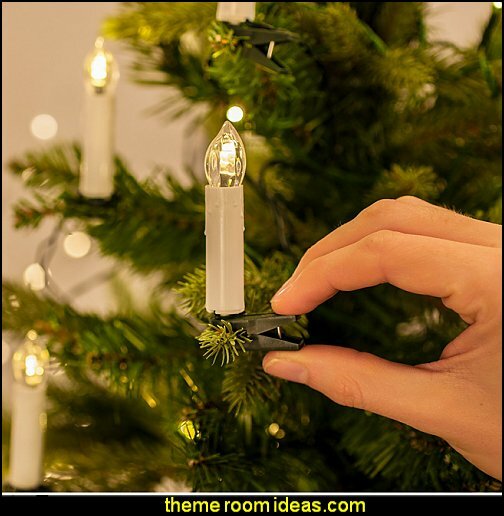 Add to a string of lights for added fun when not lit during the day. 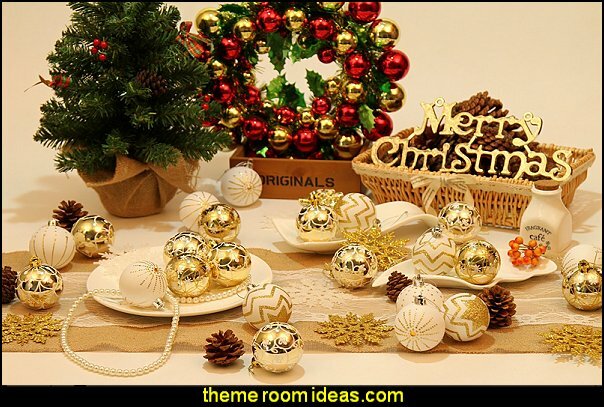 You can find these ornaments in every shape, size and color of the rainbow, just glance around the room to see where a colored ball might make a nice splash of color and decoration. 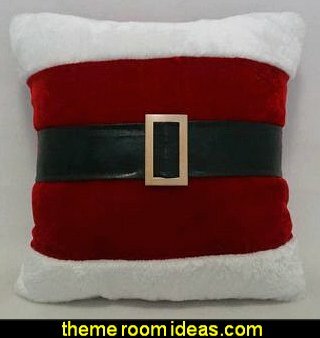 This Santa belt pillow is the perfect accent to decorate your home for the holidays. 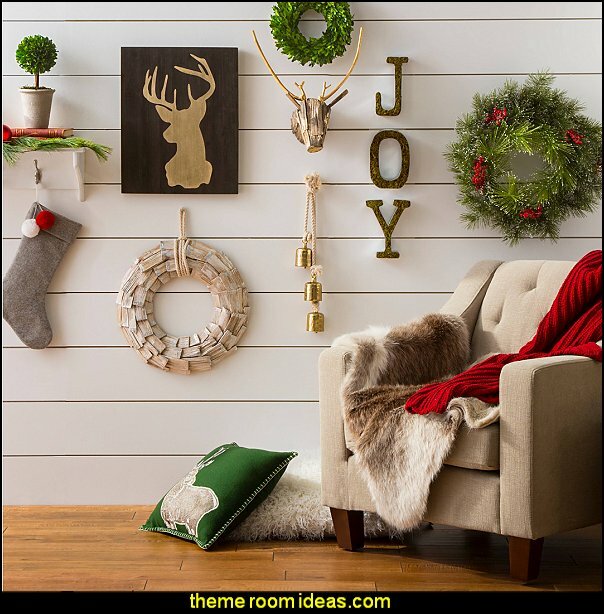 Express yourself with signs that say “Joy” or “Peace on Earth” with the Holiday Gallery Wall Collection. 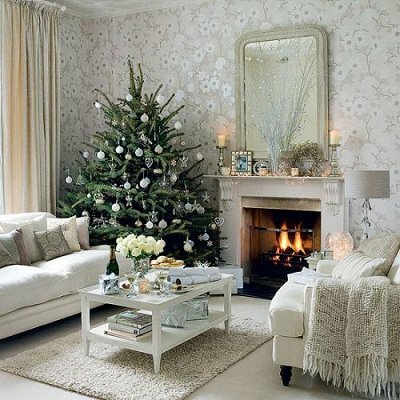 Find stars, bells, wreaths, and other Christmas holiday décor to beautify your walls or side tables with neutral-toned, low-key pieces. 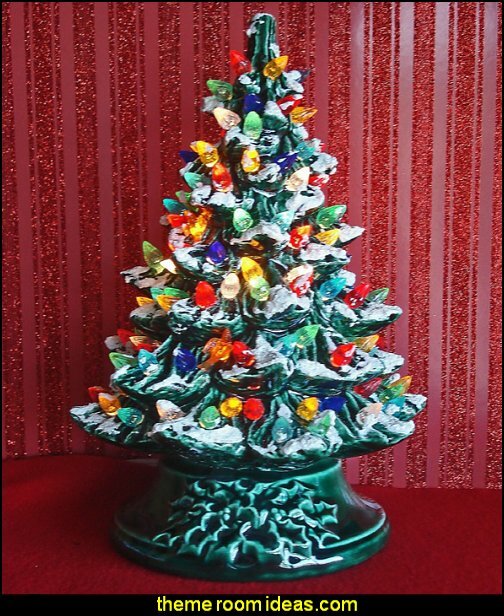 Masterfully crafted of ceramic and hand painted, each tree is hand flocked with "snow" and decorated with dozens of colorful Christmas lights. 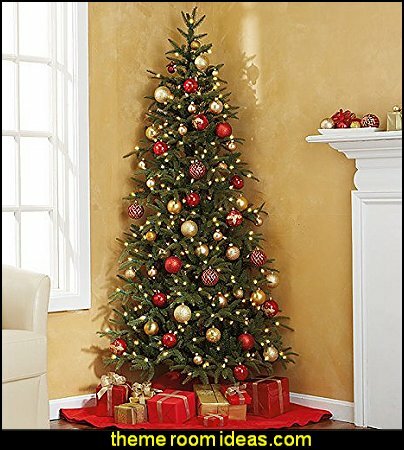 The tree sits atop a decorative base accented with a holly motif. Click the on/off switch on the cord and the tree comes to life. 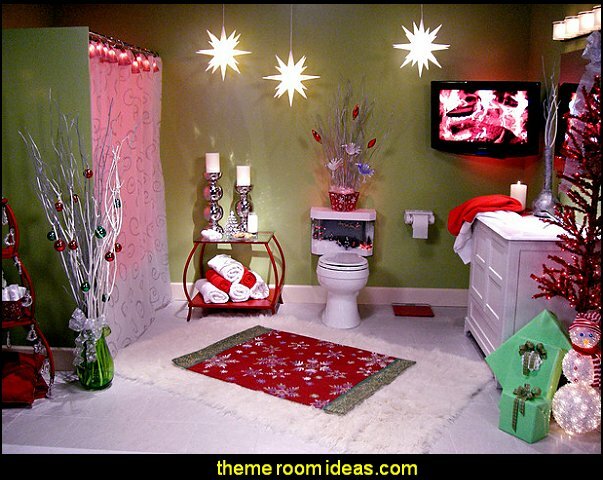 Who doesn't want an awesome-looking, super-fun Christmas themed bathroom? I'm sure no one else will have anything quite like it! 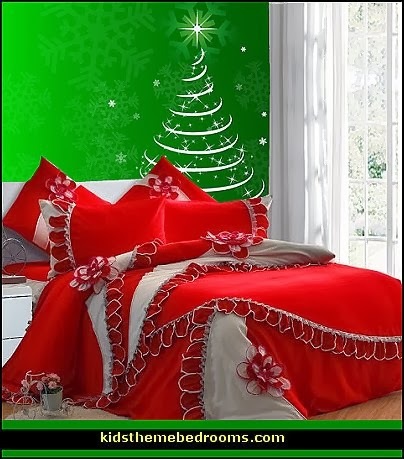 Remember to use lots of green and red, as well as a little bit of white. After all, what's Christmas without the snow? 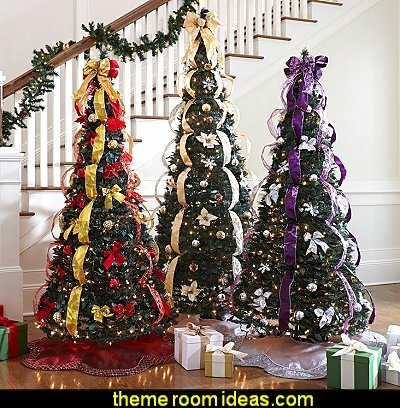 If limited on space .... but are still wanting a decorated Christmas tree ... or two ..... these trees are perfect! 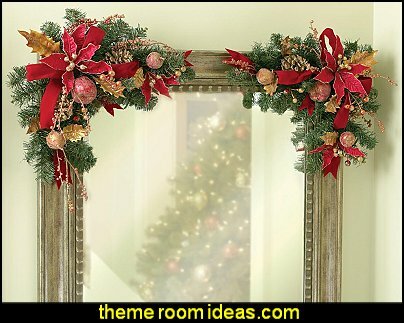 your living room wall and a Christmas tree hanging flat against your entrance wall! 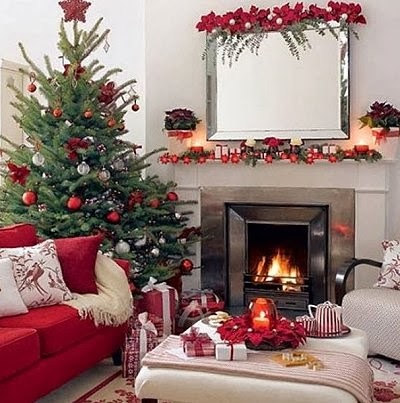 Enjoy the look of a traditional Christmas tree, even when you have little space. 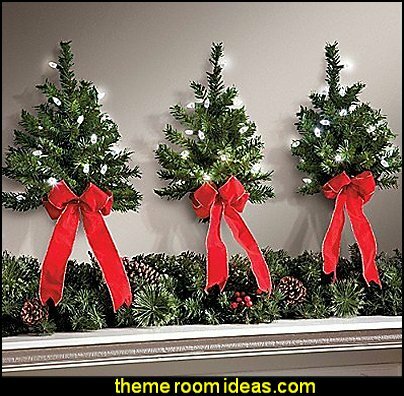 Realistic evergreen branches are adorned with white Christmas lights, ornaments and bows. Hang it up any where from a living room wall to a dorm! 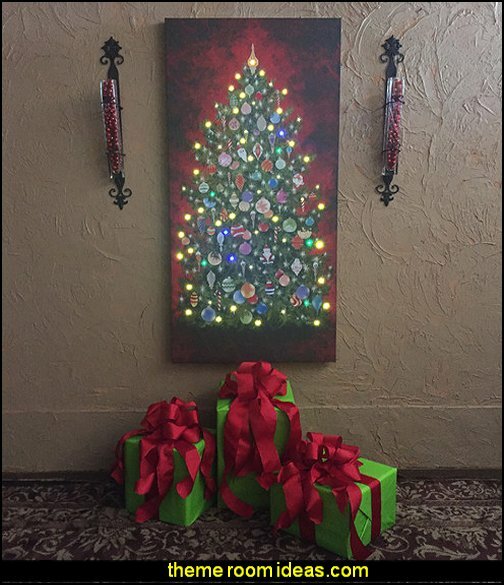 Reproduced from an original painting by Marianna Duford, our Happy Christmas Tree features over 70 LED lights with built in 4 hour timer that automatically turns on and off daily. At 59 inches tall, this lighted canvas makes an impressive statement in any room of the house. 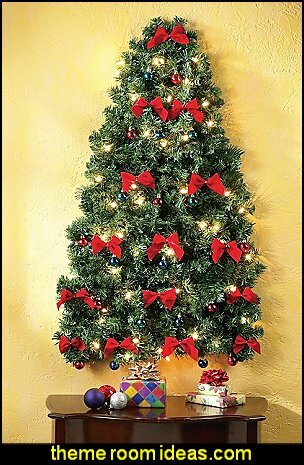 Short on time or space -- simply hang as you would any wall decor, and enjoy the beauty of a Christmas tree without the time and effort. 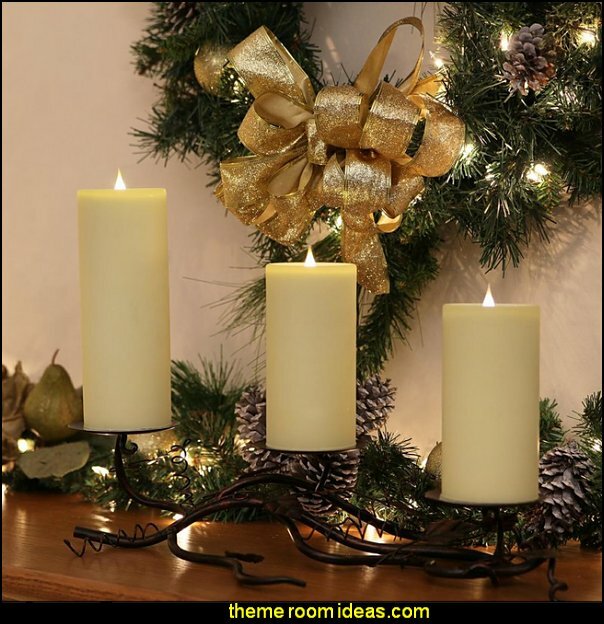 Create a beautiful Christmas atmosphere with these traditional clip-on candle tree lights. 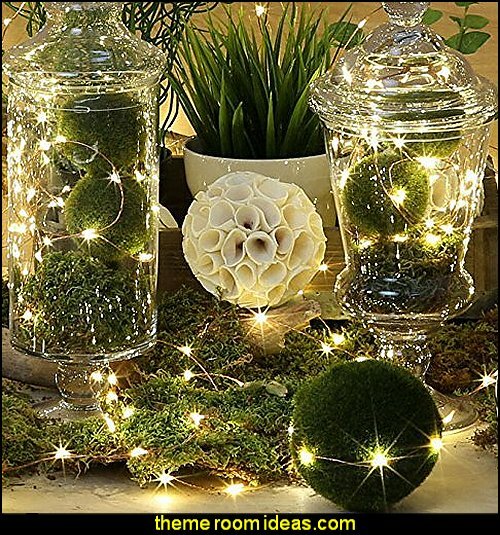 With 48ft of discreet green cable that blends well with foliage, these lights feature 50 warm white LED bulbs sitting atop realistic ivory candles with a dripping wax effect. 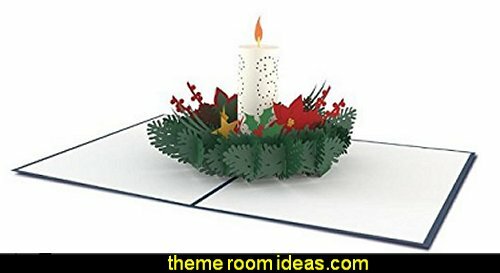 Each candle stands at 3" tall and they are mounted on a dark green peg that allows you to fasten them to branches of your Christmas tree. 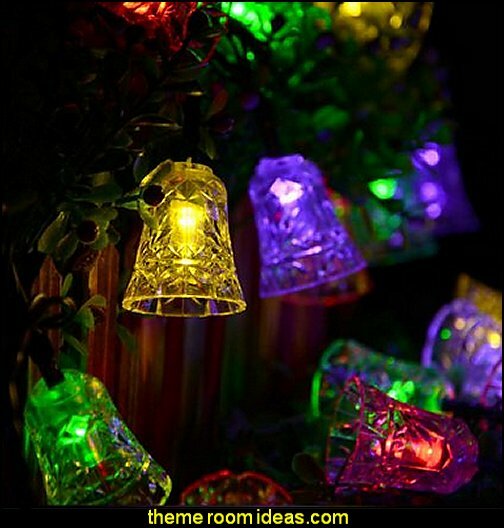 Perfect for dressing larger trees, these indoor lights feature a static light effect. 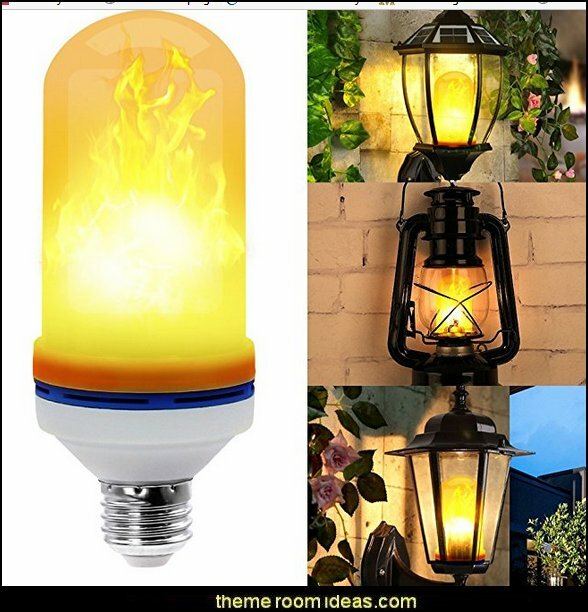 Supplied with a low voltage transformer and LED bulbs which stay cool these lights are really safe for use in your home. There is also a generous 10ft lead cable for those hard to reach sockets, making them the perfect addition to your winter wonderland. Nice ornament for a coffee drinker. For centuries, coffee has been a favorite beverage around the world. In today's fast-paced culture, "coffee-to-go" has become increasingly popular. Now to the delight of coffee drinkers, many drive-thru vendors offer premium coffee and espresso beverages in a timely and convenient fashion. Perfect for the tree and for ice cream lovers Ice cream is an especially delicious treat. However, if it is not enjoyed quickly, it soon melts and disappears. Filled with information, books expand our knowledge and offer new insights. Through literature, books offer inspiration and excitement. They spark imagination and enrich our lives. This ornament makes a wonderful gift for any book lover, scholar, librarian. Looking to turn your house into a holiday home? 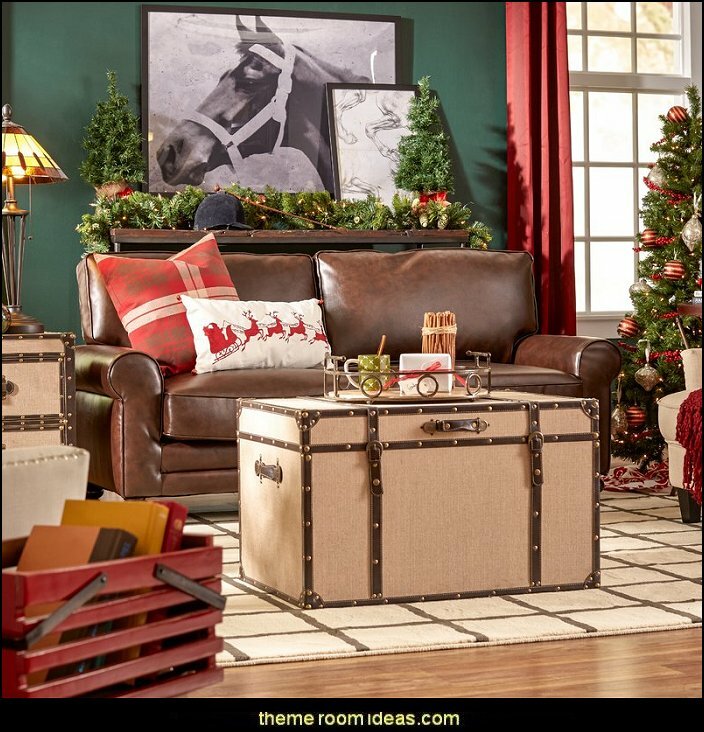 Bradford Exchange has all the trimmings to make your holidays merry and bright. 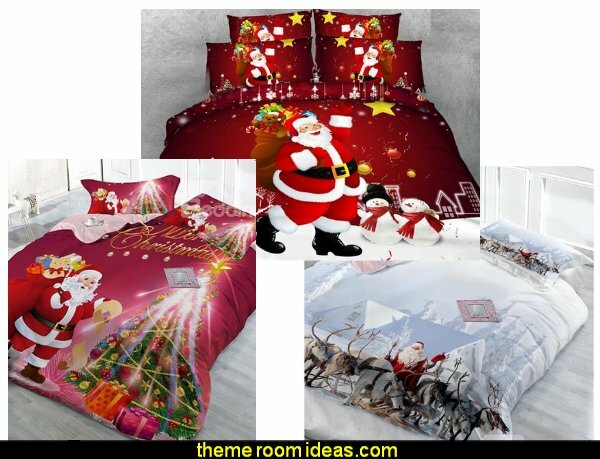 Christmas decor spans popular themes and brands like Disney, NFL, Thomas Kinkade and so much more. Christmas music boxes and Christmas ornaments to handcrafted Nativity sets and Christmas villages. This spectacular tabletop Disney Christmas decor brings together Mickey and Minnie, Donald Duck, Snow White and more to deliver the joys of the holidays in your home. 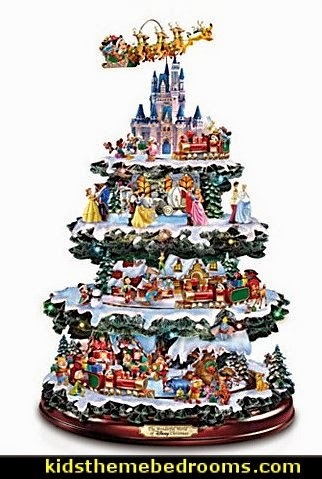 Standing 16" high and decorated with over 50 hand-painted Disney character figures, this animated tabletop Christmas decoration celebrates The Wonderful World of Disney With 4 levels of rotating movement on this breathtaking Disney Christmas decor, the Disney Express seems to "climb" ever higher up the tree, brilliantly lit by 20 LED lights. At the very top, Mickey's at the reins of a Pluto-and-reindeer drawn sleigh that rotates around Cinderella's magic castle. A medley of Christmas carols makes the festivities complete. How about a centerpiece to create a breathtaking focal point in any room? 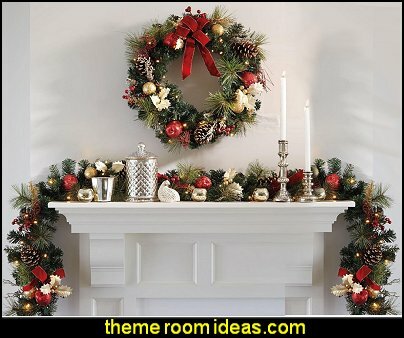 Sculpted, pre-decorated Christmas trees with unique themes, fine crystal snowman or snowmen, silken flower arrangements and other unique centerpieces. 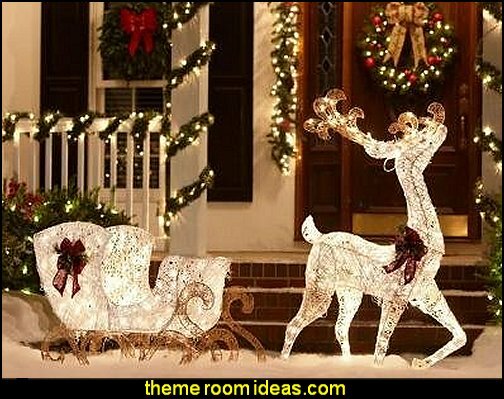 Many of them come to life with lights, music, and even motion bringing even more festive cheers to your Christmas decor. 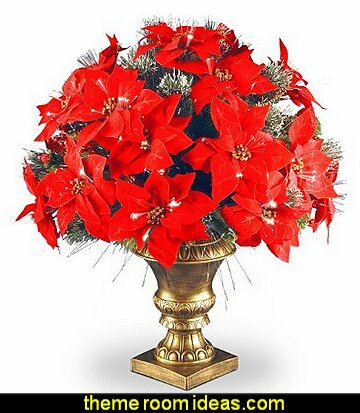 Handcrafted for heirloom value, each of our centerpieces has the eye-catching appeal and timeless design that make not just good, but truly extraordinary Christmas decorations. 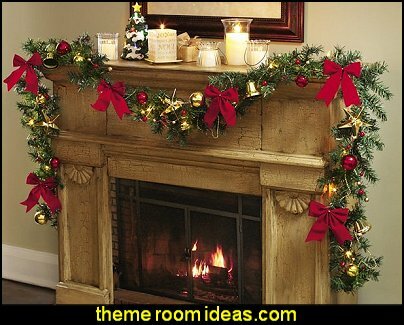 Come home to the welcoming sights and sounds of an old-fashioned Christmas, where the inviting glow of flickering candlelight and melodic carols filling the air add joy to holiday celebrations, with the Collectibles Market First Thomas Kinkade Warm Glow of Christmas Table Centerpiece. Exquisitely handcrafted in a traditional pillar candle design and features a wonderful combination of lights, music and motion that includes an endless glitter display. 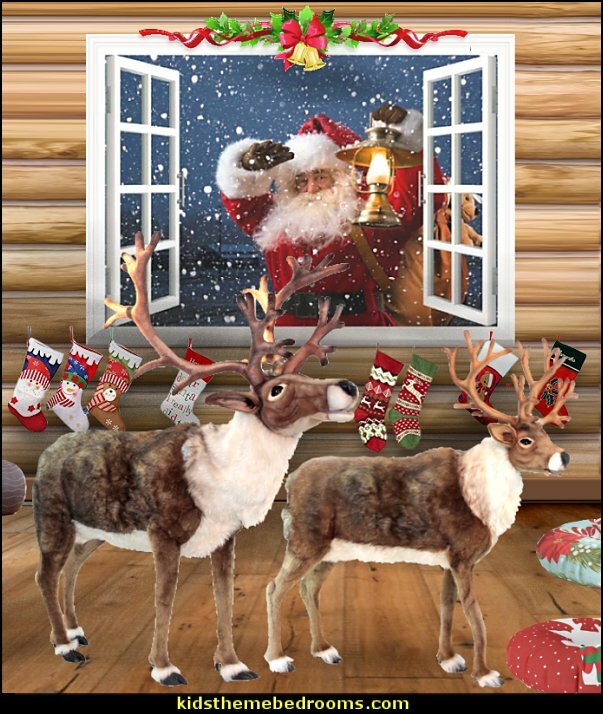 More merriment is in store as Santa and his reindeer dash up and around the sides of the candle on a glimmering ribbon of frosted Christmas Eve air. Gently shake the candle and enjoy a flourish of gleaming glitter that remains suspended inside the candle for hours on end! And that's not all… flip the switch and watch in delight as the lights inside the sculpted homes glow from within as a melody of 8 classic holiday carols play! Plus, the top of the candle flickers on and off with its own built-in switch, providing a safe way to enjoy candlelight for many holidays to come. The shiny silvery base includes a golden nameplate. 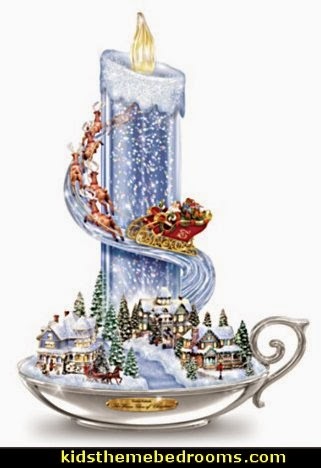 Unlike traditional candles that burn out after one season, this multi-dimensional, multi-sensory Thomas Kinkade tabletop Christmas candle will be part of your holiday celebrations year after year. 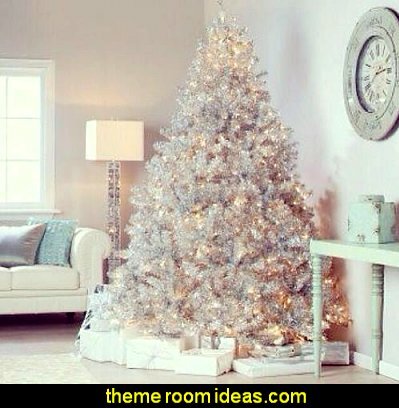 Wondering how to decorate the tree this year? 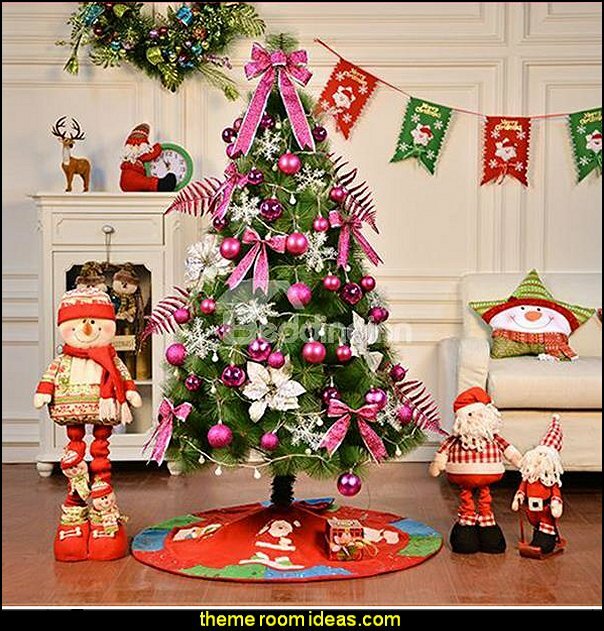 Diverse array of Christmas ornaments for every personality and style, from sports fans to animal lovers and beyond. 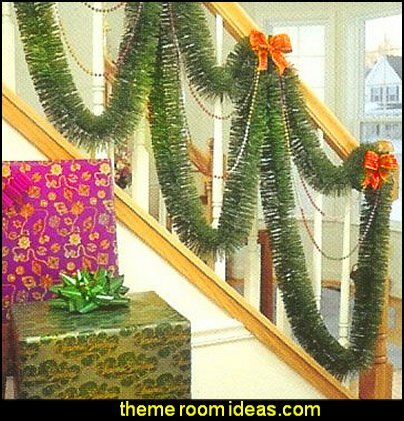 If you're short on time, consider a pull-up Christmas trees. 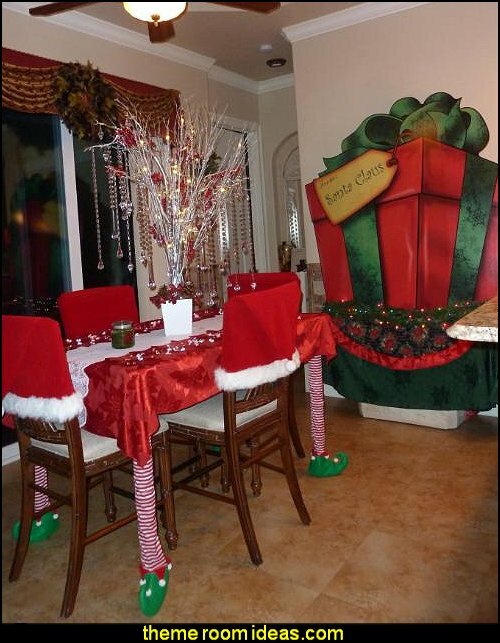 Fully decorated and pre-lit, they assemble in seconds but look like you spent hours decorating! 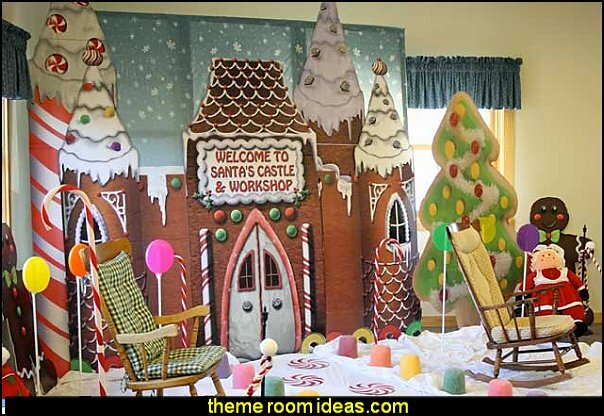 Looking for different decorating ideas? 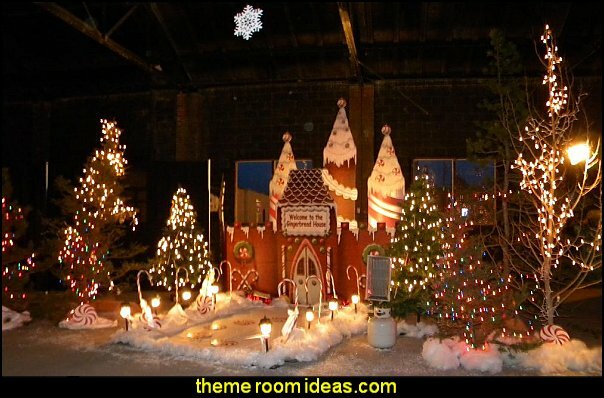 Real working Christmas train sets that will really put your holidays in motion. 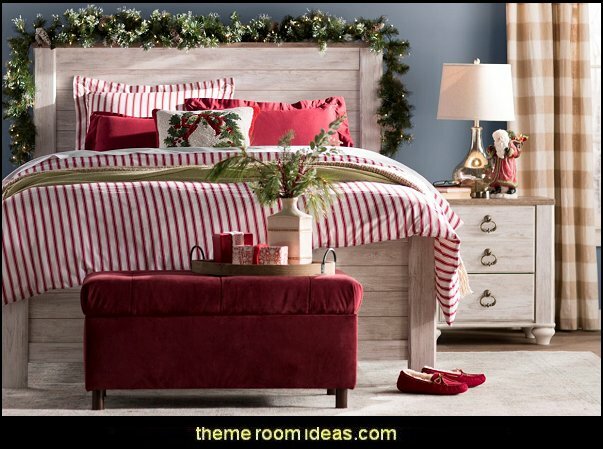 The Bradford Exchange Online help you realize all your holiday and decorating dreams. • dimensions: 6'H x 29" Diam. • cord UL approved. 125 Volt Fuse. 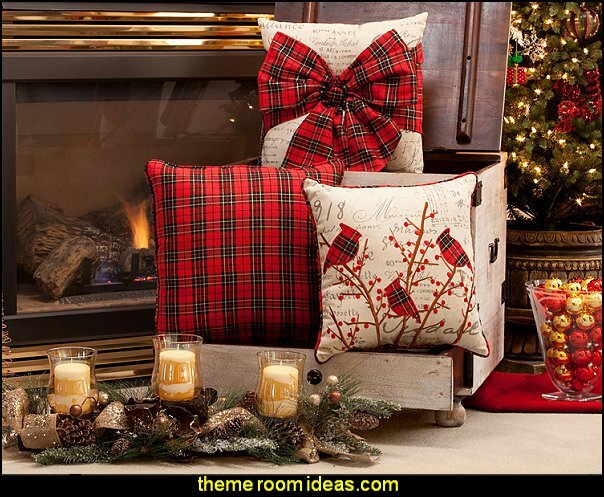 Wood Log Decorative Pillow is made to look like the real thing. This is not your usual pillow! It is made to be super plush, ergonomic, soft and fluffy so you can rest in comfort and style. 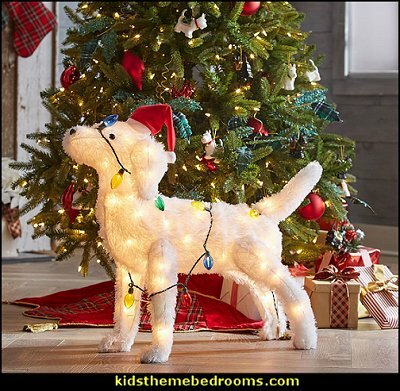 This playful dog decoration has gotten himself tangled up in 20 multi-colored holiday lights. He's also lit by 80 mini UL lights. 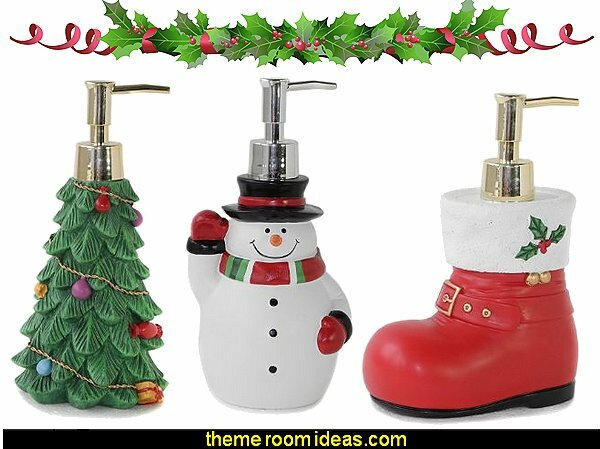 Great for indoor or outdoor use, guests and visitors will love him! Let your imagination run wild and free with this Nordic Deer Stuffed Animal. Made to educate, to provide creative play, and to wow collectors of all ages, artists created this animal from portraits of the creature in its natural habitat. Its coat was meticulously hand-cut and trimmed, not stamped out by machine. It was sewn inside out, resulting in the minimization of seams. The subtle coloring on the animal was hand painted or airbrushed by specially trained Hansa artisans. It was created with custom-designed plush material made from high pile 100% Modacrylic fiber. 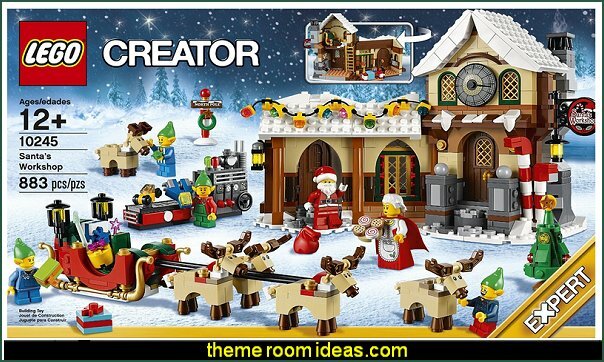 Everyone knows that Santa uses reindeer to pull his overflowing sleigh each Christmas. But do you know why he chose reindeer? Or how he got them? 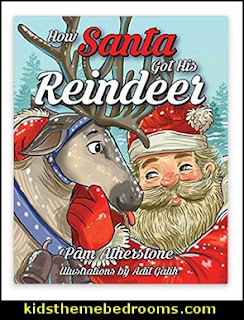 This delightful children's picture book is 34 pages and is filled with 14 full color illustrations showing how and why Santa chose reindeer. Children meet Grandfather Frost, the iconic symbol of Russian winter, New Year’s and presents. Readers are exposed to the reindeer herders of Siberia and are given a brief insight of how they live and dress. They are introduced to a Shaman and his magical powers. And finally, children have their questions answered about Santa and his reindeer. 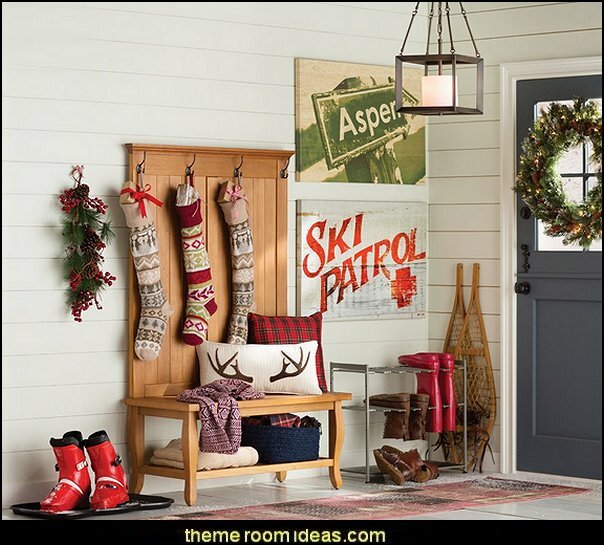 Create a Christmas winter wonderland suited for Jack Frost himself. The nativity scene is made up of 7 cardboard standees. 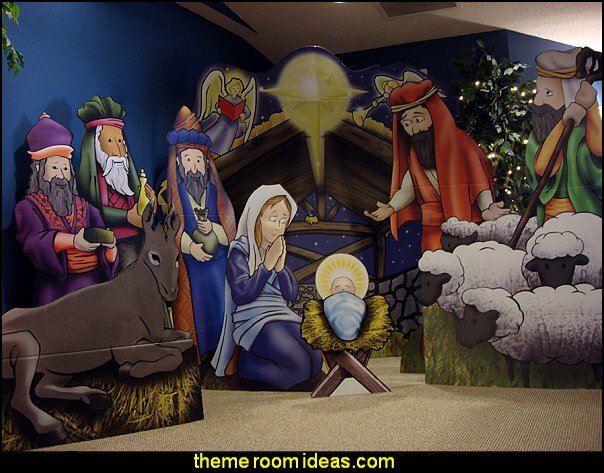 Use the Nativity Scene Standee Kit as a holiday decoration or as a prop in any Christmas play. 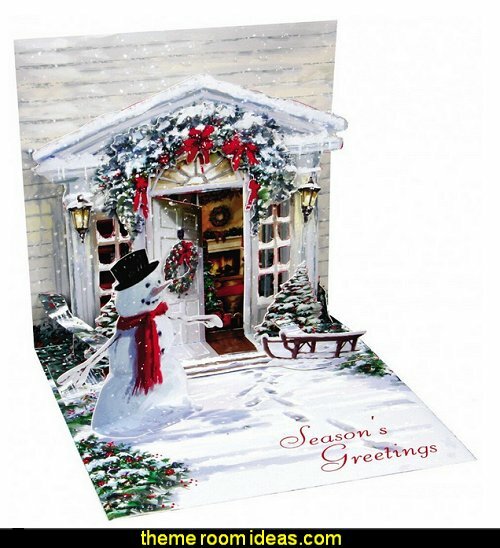 Stunning holiday card is 5 inches wide and 7 inches tall. Fun, eye-catching 3d pop greeting cards with surprising pop-ups richly embellished with glitter, ribbons, lace bows, soft plush and other items. 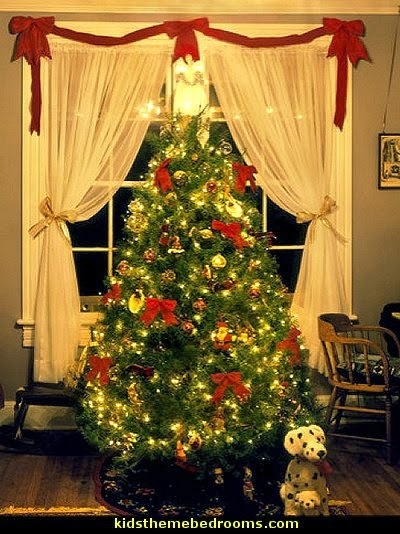 fresh, contemporary sound - The album features brand new instant classics such as the first single, Underneath The Tree, and title track, Wrapped In Red as well as Christmas favorites, Have Yourself A Merry Little Christmas , Blue Christmas , Run Run Rudolph, Please Come Home For Christmas and many more. joyous celebration of the Christmas season, performed by this Irish supergroup. The record's rich vocals and colorful instrumentals create a concert-like setting, reprising the season's most loved hymns, carols, and pop standards, along with a Gaelic version of "That Night in Bethlehem." Unexpected numbers such as "Christmas Pipes" and "Carol of the Bells". This album is just what it says -- Ultimate Relaxtion. Just turn out the lights, turn on the tree, and put this music on - and step back to Christmas in the 1960's ... if you want an album with old fashioned charm and happiness this is it. Traditionally elegant seat. Its distinctive features are at home in any classic setting, from traditional farmhouse to English Country ranch.